From the 26th of March we will start again with a new MOOC, Biobased Building! This is the fourth biobased economy MOOC, developed by the Centre of Expertise Biobased Economy. What are the newest biobased materials for building or renovating houses? And what are the properties of building materials such as bamboo or straw? In this free online course you will learn everything about biobased building and you will get started with your own tiny biobased house. We are all on the verge of a transition to a world in which we want and need to be less dependent on fossil raw materials. In the transition to this world, we aim for an economy that runs on biomass as a raw material. In order to take a good step in the direction of biobased life, biobased construction is very important. Today, many new techniques exist to build or renovate energy-neutral and biobased materials. In this MOOC Biobased Construction, you learn to apply the latest biobased materials in new construction and renovation. Your assignment is to design a cottage, tiny house or a cabin with only biobased materials. You learn how to process the different materials in the roof, the façade, the floor, in all parts of the house. This MOOC is specially written for college students in their first and second year of architecture and construction and professionals. The course is free and self-paced. Target Audience: Construction and architecture college students in the first years of their study; young professionals. The online modules consist of video instructions, interesting literature, assignments, quizzes and discussions with other participants. This MOOC has been specially developed for HBO students of Architecture and for young professionals. You can complete the course in a maximum of 28 hours and receive a certificate after a good assessment. 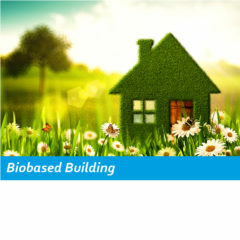 In a short time you have mastered the basics of biobased building! The MOOC consists of the following themes: Introduction – Wood – Bamboo – Straw and Reed – Hempcrete- Bio composite – Hemp and Flax – Mycelium. Your assignment is to design a holiday home, tiny house or a cabin with only biobased materials. You learn to use the different materials in the roof, the facade, the floor, in fact in all parts of the house. Course is offered by the Centre of Expertise Biobased Economy. This MOOC was developed in the context of the Interreg Flanders-Netherlands project Boundless Biobased Education.